The function of this plaque is not certain . It has two remaining prongs with circular finials to retain it in place and to allow suspension of the lower section with the lion and vajra symbols. 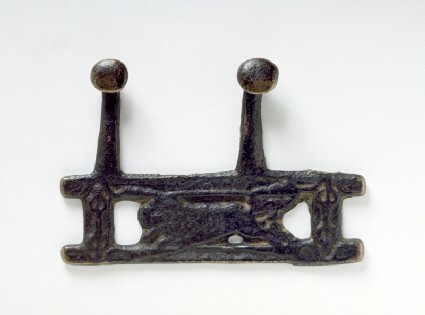 Possibly the prongs were designed to retain one strand of a leather or fabric belt, while the lower section retained a second strand behind the lion. The back of the plaque is completely smooth so it could have been worn at the waist. The prongs are too small to have served for hanging anything except a light fabric. The upper area of the prongs does not show additional wear at the rear side. The lower section is rectangular in shape, 7 cm in length. There are two horizontal bars which have a curved edge in relief, while the centre is flat and devoid of decoration. The two vertical bars are each decorated with a vajra in relief. 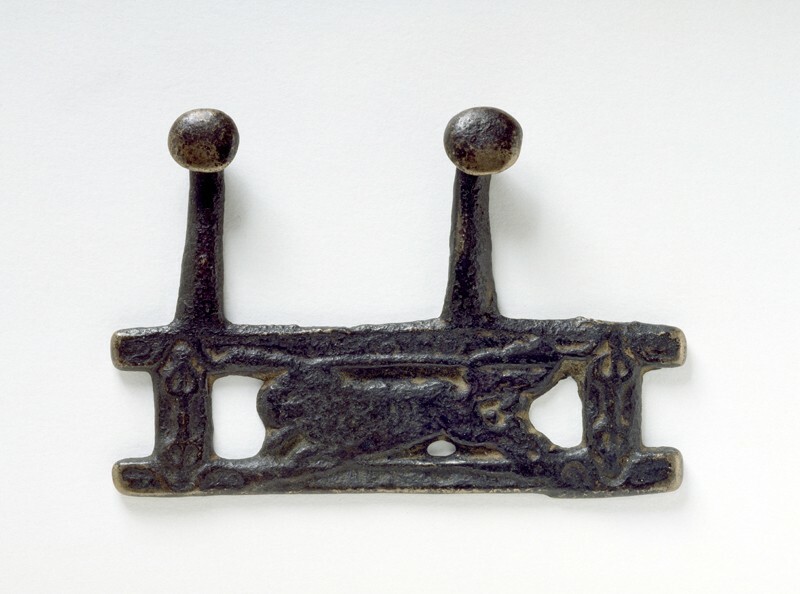 The tips of the vajra are inset in the horizontal bar, whose curved edge is modelled to enclose them. The head and face of the rampant feline are rather worn, but there appears to be a mane. The silhouette and proportions are also similar to the lion represented on the bow-plaque (cat. 28). In view of the importance of the lion as a symbol of power both in ancient Tibet and in Buddhism, it seems probable that this creature is indeed a lion, framed here within the two vajras. In his study of several hundred early Tibetan amulets, Anninos has suggested that utilitarian objects with the lion motif in particular, together with Buddhist ornamentation, are to be attributed to the Tibetan imperial period . 1 Published in Anninos, 'Tokches: Images of Change in Early Buddhist Tibet', fig. 12, p. 97. 2 Anninos, 'Tibetan Buddhist Amulets', p. 115.